Join our newsletter to receive information about upcoming Storefront events. Image by Bryrony Roberts, 2018. As part of the closing of Marching On: The Politics of Performance, The Marching Cobras of New York return to perform at Storefront’s gallery space. Afterward, Terrel Stowers and Kevin Young, leaders of The Marching Cobras, will engage youth members of the group in a discussion about their experiences and understanding of the politics of performance in public space through the projects. The discussion will be moderated by Bryony Roberts and Mabel O. Wilson. This event is generously supported by the Royal Norwegian Consulate General in New York. 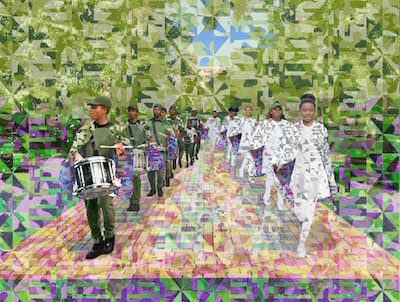 Marching On: The Politics of Performance is supported by the National Endowment for the Arts, the Graham Foundation for Advanced Studies in the Fine Arts, and the Lower Manhattan Cultural Council. Storefront’s programming is made possible through general support from Arup; DS+R; F.J. Sciame Construction Co., Inc.; Knippers Helbig; KPF; MADWORKSHOP; ODA; Rockwell Group; Roger Ferris + Partners; Tishman Speyer; the Foundation for Contemporary Arts; The Greenwich Collection Ltd.; the Lily Auchincloss Foundation; the New York State Council on the Arts with the support of Governor Andrew Cuomo and the New York State Legislature; public funds from the New York City Department of Cultural Affairs in partnership with the City Council; The Peter T. Joseph Foundation; and by Storefront’s Board of Directors, members, and individual donors. All Storefront events are free and open to the public. Seating is on a first come, first served basis, with priority seating available for members of Storefront. If you are a member and would like to reserve a seat, contact jk@storefrontnews.org.